TOKYO — Japan’s parliamentary debate on the Trans-Pacific Partnership turned into a shouting match Wednesday after the agriculture minister suggested the ruling coalition force a vote on the U.S.-led trade deal, with the rancor threatening the government’s timetable for ratification. Yuji Yamamoto apologized and took back his comment at meeting of a special committee on the TPP in the lower house of the Diet. Chief Cabinet Secretary Yoshihide Suga told reporters Yamamoto’s remark "could lead to a misunderstanding" and said he had given him a strong warning over the phone. But Suga dismissed opposition party demands that the minister resign, saying "it’s not that kind of problem." At a party hosted Tuesday by Tsutomu Sato, the ruling Liberal Democratic Party’s Diet affairs chief, Yamamoto said that "it’s up to Mr. Sato to decide whether to force the passage" of TPP-related bills. The suggestion that the ruling coalition hold a vote on the legislation even if opposition parties refuse to participate triggered a significant backlash. The leading opposition Democratic Party on Wednesday pressed the LDP and junior coalition partner Komeito to promise not to railroad the bills through the committee, but the latter refused. The TPP committee meeting was scheduled to start at 1 p.m., but was pushed back for about six hours. The Democratic Party and the Japanese Communist Party left the session early, leaving just the ruling coalition and Nippon Ishin no Kai to carry on with the proceedings. The ruling coalition then decided without any input from the two major opposition parties to hold regional hearings — a key step toward voting on the bills — on Monday. Any later date would make it difficult for the lower house to pass the TPP-related legislation by the end of the month as Prime Minister Shinzo Abe’s government wants done. "The appropriate response would be for the prime minister to warn [Yamamoto], and for the agriculture minister to resign," said the Democratic Party’s Masato Imai, a member of the TPP special committee. Just last month, an LDP member stepped down from the panel after making a similar comment. 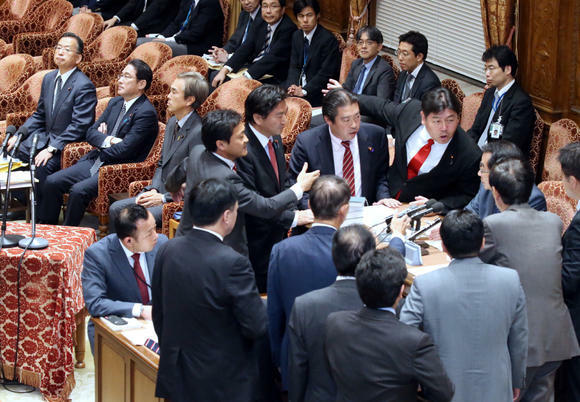 Abe told the committee Tuesday that the remark "was not in line with the party’s position." The standoff is disrupting other legislative matters as well. The ruling coalition on Wednesday gave up on its goal of ratifying the Paris Agreement on climate change by the end of the week. It instead will give priority to the TPP debate and create a special committee on the issue in the upper house as well. The Diet is also unlikely to start deliberating on pension reform, another key topic for this session, by the ruling coalition’s initial target date of Thursday. The Democrats and other parties tried to delay the opening of a lower house health and labor committee meeting on Wednesday, mainly in opposition to the government’s plan of jointly discussing a bill that would cut pension payouts, and another that would reduce the years citizens have to pay in to the system to qualify for benefits. The Democratic Party and others demand that the latter bill be considered separately and be passed as soon as possible. "The government is trying to force two things through," the Democratic Party’s Kazunori Yamanoi said regarding TPP and pension reforms. "We absolutely cannot let this happen."